The explosion of data in fixed income markets has changed the way that portfolio managers have traditionally operated. Manual spreadsheets no longer cut it, and firms that want to stay ahead of the competition need to invest in cutting edge data and analytics technology. It is not just simply about investing in technology – fixed income managers need transparency too, as it is critical to every portfolio manager that the numbers they are using to make investment decisions are accurate, and that they have the tools necessary to investigate anomalies or to go back in time to research a conclusion. New regulations – and future ones to come – also make transparency a critical part of a money manager’s job. As noted by Nasdaq, new requirements such as MiFID II are increasing pre- and post-trade transparency requirements on a broad range of financial instruments and markets that previously traded with limited transparency. 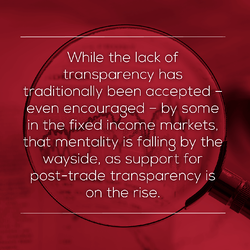 While the lack of transparency has traditionally been accepted – even encouraged – by some in the fixed income markets, that mentality is falling by the wayside, as support for post-trade transparency is on the rise. One poll of senior buy- and sell-side market participants found that 72% of European capital market participants believe that there is not sufficient transparency in the European fixed income markets. Furthermore, pre-trade transparency is an issue that is top of mind to the SEC, and was recently discussed in a Fixed Income Market Structure Advisory Committee meeting over the summer. Regardless of regulatory pressures, transparency can be quite useful to the PM when challenging conclusions or going back into the data to see where and how it was derived, attributed or built – both of which better inform future decisions and can help answer difficult questions when dealing with LPs, DDQs and similar forms.Transparency is essential in modern institutional finance, and tools such as StatPro Revolution can enable managers to help rather than hinder. Another key aspect of any data analytics platform for portfolio managers must be usability. Knowing this, we created features for our Revolution platform released earlier this year to make usability a core priority for fixed income managers. Our users are now able to customize the presentation of end results in an unlimited number of configurable dashboards that mix and match components as desired. Data on performance, attribution, risk metrics and much else can all be shared in a simple and easy to digest format, and managers can easily and quickly create output that is customized specifically for various internal and external stakeholders. This means you can create highly visualized, easily consumable reports that can be understood by everyone. It should be noted these features came about primarily as a result of client feedback. Our clients told us they wanted to build their own output using customized templates, measures and graphs and not be pigeonholed into generic presets. With the improved customization, the number of one-off questions from stakeholders trying to understand complex data through the lens of preset templates can be reduced. Ultimately, fixed income managers want a platform that will deliver them actionable insight out of large amounts of data in an efficient manner, with ease-of-use and customization. We believe Revolution does exactly that.